(1) - Does the monthly cap go from 1st to 1st of the month, or from your bill date? 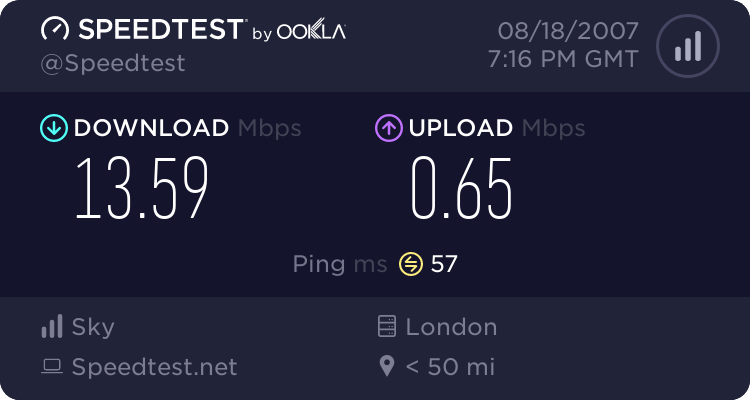 (2) - I'm on connect (40GB cap) - what's the charge for going over this cap? I've found mention of "reasonable charges" but no numbers anywhere. Anyone got any experiences or numbers? Re: Cost of going over the 40GB cap? There is no documented case of anyone being charged for going over their useage. I'm sure that if you don't take the mickey, then it should never need to be enforced. Not an official - Download loads, just from reports on here. Sorry we had an issue with the word Print in the title, due to the rewrite rules on the software we use. All resolved and OP put back. Unless Sky provide a download usage meter/count via the customer portal, so that you can see how much you have downloaded in a billing period, I don't really see how charging for exceeding the monthly download allowance could be enforced. You could monitor your own usage via NetMeter or similar software, easy if you've only got one (Windows) PC, not so good if you've got non-windows computers and devices (e.g. Macs, TiVos) connected to the internet via your own LAN (because NetMeter etc tends to be Windows only software). My work colleague regularly went over his usage allowance (ISP escapes me at the moment) due to torrenting. He got 2 written warnings before they cancelled his contract. To be honest if you've gone over by a small percentage a few times then i wouldn't even worry. However, if you're at 60gb and dloading movies everyday then I wouldn't want any attention being drawn to me! I noticed on DU Meter that I had reached 70 gb somehow (normally 12 gb/month) and just wrote it off to all the new installs on my new computer (lots of games bought online). I was a fan of DU Meter and it is a good program, but I notice that NetMeter has an option to set the start date in a month. Good for monitoring the usage over a billing month rather than a calendar month.